Recently we have posted Terry Mattingly’s column where the author refers to the speech offered by Metropolitan Methodios at the 2013 Metropolis of Boston Clergy–Laity Conference. Since the article has attracted a lot of attention from our readers, we offer you an excerpt from His Eminence’s address. Our parishioners are fully integrated into the religious and societal landscape of America and, as a result, they live their Orthodox faith quite differently than did our parents and grandparents. More and more brethren differentiate their religious and moral beliefs from the teachings of the Church. This is the result of their interactions with people of different religious, races, cultures and ethnicities. It is the result of the constant bombardment of materialistic and hedonistic philosophies promulgated and advanced in the media. People today fashion their personal beliefs by integrating Orthodox and non-Orthodox elements. Without realizing it, they become “cafeteria Christians.” Just as they do not partake of every food item on a cafeteria line (but only those foods which they like), in the same way they feel they can pick and choose from what Orthodoxy teaches, that is, what teachings they accept and which they choose not to accept. As Orthodox Christians we run the risk of falling into – being totally consumed – in the cultural melting pot of America, thus losing our identity. Core teachings of our faith are not subject to popularity polls or political correctness. The changes in the moral standards in our society are obvious. We live in a culture of cruelty and an age of entitlement. We have become so accustomed to this slow deterioration of morality in society, that we have adapted to the moral decay around us and taken it for granted. We live in a world of moral and ethical relativism, hedonism and selfishness, a world in desperate need of spiritual renewal. For a long time now, Sunday has ceased being the day that we worship Almighty God and then sit as a family at our dinner table to enjoy fellowship. Sunday has been relegated to a mere weekday, a day to do the laundry , to go to the mall, to read the newspaper, to take our children to sporting events, etc. Prayers are no longer offered in our public schools. The Ten Commandments have long been removed from our civil courts. I would dare to say that those of us who serve on parish councils and other leadership roles in our communities rarely pray or read the Gospel on a daily basis. Lifestyles previously kept in the closet – where they belong – are now championed as reputable and worthy of emulation. I am sad to note that a legislator here in New England (who claims to be an Orthodox Christian and who champions Greek political causes) not only voted to change the law in his state to redefine homosexual unions as marriages – he asked for and received special permission to preside at a civil ceremony uniting a homosexual couple! Christianity is under siege not only here in America, but throughout the world. I fear the day is fast approaching when no Christian will be left in the Near East. It seems that every day we learn of the brutal killing of Orthodox and non-Orthodox Christians in Iran, Iraq, Afghanistan, Egypt, Syria, Palestine and India. You will surely agree that our mission as an Archdiocese, a Metropolis and individual parishes is to lead our brothers and sisters-both inside and outside the Church-to our Lord and Savior Jesus Christ. This is becoming more and more difficult because many hesitate to share their faith, fearing they will be considered quaint and bothersome. This is especially the case in America’s colleges and universities where atheism and indifference on matters of faith and religion reign supreme. We must ask ourselves if we take that commandment seriously and respond with the same zeal as did the 12 disciples that did “go” into the world to teach and make disciples. Do we go out into our parishes, our towns, our cities and neighborhoods to bring the message of salvation? Every community… has large number of faithful that are for one reason or another not active in their parish. Do we “go” to them? Do we go to those that are not baptized to share the evangellion of salvation? Do we “go” to our young adults, many of whom are professional men and women, to encourage them to serve on our parish councils-to bring new ideas and enthusiasm to the work of the Church? 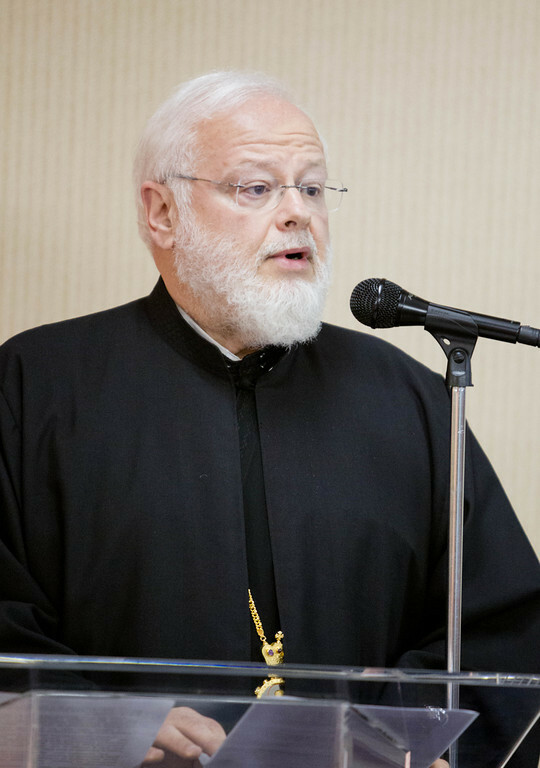 Excerpted from Metropolitan Methodios’ address to the recent Metropolis of Boston Clergy–Laity Conference.